Students, parents and faculty are invited to attend, serve, and participate in all Masses at Cathedral: Saturday @ 5 p.m. and Sunday @ 8 a.m., 9:30 a.m. (Children’s Mass) and 11 a.m.
Dress-Down Day for students. Please bring in $1 to wear sports attire/jerseys. All proceeds will benefit Catholic Charities. 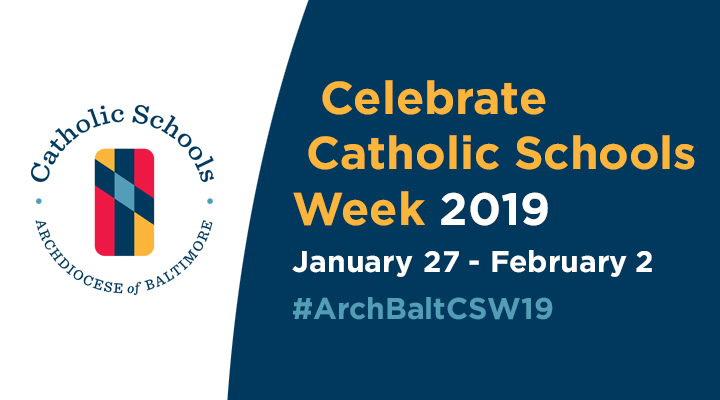 To kick-off Catholic Schools Week, CASPA would like to treat our amazing students to lunch on Student Appreciation Day, Monday, January 28th. Lunch includes one Chick-Fil-A Sandwich, chips and a cookie. LunchBox service will NOT be available on this day. Please remember to cancel your orders if you had previously ordered. If your child does NOT want a free Chick-Fil-A lunch on Monday, 1/28, please opt out here. Allergies: Marjorie Wasson has kindly offered to go to Wendy's to ensure that those children whose food allergies can also have a special lunch. Please note this option is for those children with food allergies only and not for those who may simply have a preference for Wendy's over Chick Fil A. Please contact her at mpwasson@yahoo.com to make arrangements. Open House for both current and prospective families! Call Fiona Diemer at 410-464-4117 to learn more. Current families are welcome to come for a period or come all day. Prospective families are welcome between the hours of 8:30-11:30am. We will have a community panel for prospective middle school parents with families that have been through the middle school. 4th grade partners with 6th grade for a morning in Middle School: 8:05-11:30. Special prizes and snacks will be provided for the 4th and 6th graders. We will have a Pep Rally for the 4th and 6th grades and a Stars and Stripes game in the gym after classes at 10:45-11:30. 6th graders may wear Stars and Stripes shirts and gym sweats and 4th graders may wear gym uniforms. Career Day Speakers: 1:00-2:30pm - This is a chance to learn about different careers from alumni and community members.